Yes, Royal Life Centers is licensed by both the state of Washington and Arizona. It is also one of very few facilities in the country that is dually accredited by the most prestigious health care regulating agencies. Royal Life Centers facilities are accredited by both the Commission on Accreditation of Rehabilitation Facilities (CARF) and Joint Commission on Accreditation of Healthcare Organizations (JCO). All Arizona facilities are licensed by the Arizona Department of Health Services (ADHS). All Washington facilities are licensed by the Department of Health (DOH) and the Division of Behavioral Health and Recovery (DBHR). 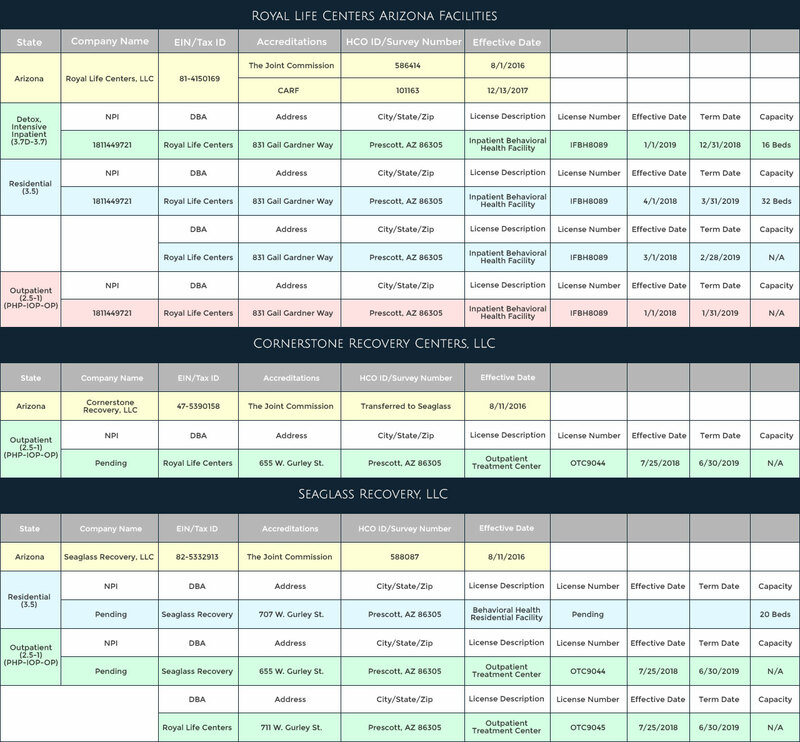 You can find all of our licensing information here. The staff-to-guest ratio at Royal Life Centers is 1 staff member for every 2 guests. We strive to ensure that our staff is able to fully observe and meets the needs of each guest we are serving. You can be sure that you or your loved one will feel valued and respected with this much attention and support. What is the staff like? What is their background? What is their education? Are any of them in recovery? All qualifying staff are fully licensed through the department of health. Staff consists of licensed, master level and/or professional therapists, registered master level interns, Registered Nurses, Physician Assistants, Doctors, trained administrative staff, and behavioral health technicians with both experience and training in the field of addiction. While Royal Life Centers does not require staff members to be in recovery from drugs or alcohol, our staff members are either in recovery or they have been personally impacted by addiction. All of our staff have a sincere dedication and passion for the process of recovery. Each one strives to help guests better themselves while encouraging family members to get the support and knowledge they need to help their loved ones on their journey of recovery. Is the facility clean, organized, and well-run? Royal Life Centers believes that organization within your personal life leads to quality recovery. Both staff and guests are required to maintain an organized and clean living environment and workspace. Staff sets the example for guests to model. Both staff and guests are assigned responsibilities to ensure a well run and clean environment. The facility is highly structured and we have specific protocols set in place to keep all facilities operating at the highest standards. Does the treatment program address sexual orientation, physical disabilities and provide age, gender, and culturally appropriate treatment services? Royal Life Centers believes in an individualized treatment plan for every guest that walks through our doors. Guests will work both one-on-one with a therapist to determine the specific needs that should be addressed to promote growth. Groups are tailored to each guest’s individual needs. Royal Life Centers empowers guests to develop their own treatment schedule through choosing groups that reflect the issues they are struggling with. Our facility is designed to meet the needs of all guests and we have wheel chair access at all main entrances. How does the program involve the family in the treatment process? Royal Life Centers believes that the inclusion of family therapy to the treatment process is essential to success. Families are contacted upon their loved ones admission and each time they successfully complete a phase of the program by our case management team. Therapists will communicate with families once per week during the course of treatment and additionally will provide family therapy when appropriate. Families are encouraged to contact our facility any time there are questions or concerns. We also have websites, family programs and social media groups specifically geared to meet the needs of the family. These outlets provide information, support and a sounding board for any questions or concerns as they arise. Is there family counseling? Are there services for parents and siblings of a parent? If not, can they refer the family to appropriate services? Family members are encouraged to attend alcoholics-anonymous meetings in their area while their loved one is seeking treatment at Royal Life Centers. Attending self help groups are an important part of the healing process and assists with the family weekend program offered by Royal Life Centers once per month. Participation in the family weekend will be discussed with the primary therapist during the course of treatment. On an as needed basis, each therapist is equipped to determine the necessity for continued therapy and will then provide the appropriate referrals or contacts. Is the staff knowledgeable about and willing to consider the use of medication that may help treat addiction? Royal Life Centers has a full medical staff that is willing to consider alternative treatment methods if the need arises, with the exception of narcotics. Each and every guest is fully assessed by our medical doctor and staff, and then an individualized detox and/or medical regime is established. A history and physical, nursing assessment, and psychiatric evaluation will be completed on each guest to ensure to ensure all medical needs are met. Medication Assisted Treatment, such as Naltrexone, will be offered to those guests experiencing cravings. Our Medical Director and medical staff are available 24/7 to our guests. Royal Life Centers believes our guests should maintain personal focus while in our detox and residential treatment level of care, however guests are allowed to leave property during the nine week program for family visits. Appropriate books are acceptable as well as art supplies within reason, i.e colored pencils and small sketchbooks. Detox length is determined based on medical assessment on arrival and will be either four or eight days. Royal Life Centers employs licensed addiction therapists. If a guests wishes he or she can make appointments with an outside psychiatrist during our nine week program. Is this a lock down facility? Royal Life Centers is a private facility and like other private facilities we have an open door policy, therefore your loved one can choose to leave at anytime. However our staff will do everything in their power to convince your loved one to stay and complete their treatment. We have case managers who will help with Family Medical Leave Act (FMLA) and disability paperwork. While your loved one is in detox or residential treatment our guest’s individual therapist may feel it necessary to get family involved via conference calls. However, upon request we can schedule individual family sessions during the nine week program. Give us a call at (877)-RECOVERY or fill out the form on the right and we will be happy to answer any questions you might have.